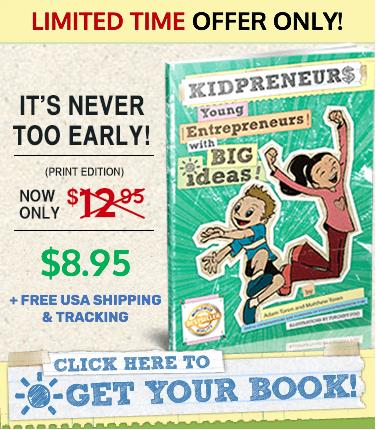 7 Keys for Finding Awesome Mentors - Kidpreneurs - Young Entrepreneurs with Big Ideas! There are about a million things people will say are critical for your success as an entrepreneur. Having a great idea to start with is important, and so is stamina, education, and an ability to persevere through the tough times, just to name a few. But I have always thought that perhaps the most important tool any young entrepreneur can have is a good mentor. While all those other skills, traits, and tools are important, it’s a mentor that can help you with each of them. A good mentor is the Swiss Army Knife of entrepreneurship. Wondering if your idea is a great one? Ask your mentor. Need to get educated on an area of business? A good mentor will be able to help or point you in the right direction. Struggling with keeping your stamina and perseverance up? Mentors can be great motivators. At a very early age, my brother Matthew and I had a mentor that shaped our lives forever. Our Grandpa Joe, was a natural entrepreneur, and he started us out on our entrepreneurial journey while we were still in grade school. With his help and guidance, our first business was launched, selling these little trick airplanes at a local festival. He helped us with our marketing strategy and our presentation, which included learning how to really “wow” the audience with cool tricks. That taught us the value of keeping your target market interested, and it gave us our first success, selling out of our inventory quickly. Like all good mentors, Grandpa Joe knew what he was doing, could be trusted 100%, and truly cared about our success. And like the very best mentors, his lessons are still poignant and relevant years later. To this day, Matthew and I find ourselves remembering his sage advice when we plan and run our businesses. My brother and I know how lucky we were to have easy access to a wise and willing mentor. Not all entrepreneurs are as fortunate. But, as with so many things in life, you don’t need luck to gain the advantage of a mentor – just some work on your part. Below are 7 keys for finding mentors to help you through every step of your entrepreneurial adventure. Key #1 – Identify who you need. As you go through the various stages of your business, from startup, through growth, possible funding, and eventually an exit, your needs change in many areas. This includes what you need in a mentor. Wherever you are in your business now, take the time to figure out what you need in a mentor. Whether you need help with marketing, personnel, growth management, or general operations, your mentor should have the experience you need. Create a “wish list” for the perfect mentor. List all the skills and qualities your mentor would have if you found just the right person. This will help you when you go on to the next tip. Key #2 – Network, network, network. Whatever business you’re in, networking is critical for long-term success. From getting to know others in your industry to finding great sources for leads, and for finding mentors, networking rules. The best mentors are going to be out there networking too. Great mentors tend to be connectors, and connectors are networking pros. So find some events where you’re likely to find the person you identified in tip #1, and start mingling. Also consider online networking. LinkedIn is a great way to connect with people, as are high quality entrepreneur forums. Key #3 – Be a listener. Have you ever had a conversation with a know-it-all? Don’t be that guy or gal. If you’re looking for a mentor, it makes sense that you’re trying to find someone who knows more than you do about certain things. So instead of trying to impress people or make sure your points are heard, try listening. Ask questions about your potential mentor’s background and their life. Show them that you’re able and willing to shut up and listen. Key #4 – Be a good mentee. If you want a good mentor, you have to be a good mentee. That means listening well, as mentioned in the last key, and it means being open to suggestions and feedback. An outside perspective on your business and how you’re running it can be invaluable, but only if you’re willing to be a good student. Key #5 – Have realistic expectations. People who make good mentors are successful, and successful people are busy. Don’t expect a mentor to spend tons of time with you or be available for your call 24/7. In fact, some mentors may only be available for a single meeting. That’s okay. Make the most of whatever time you can spend with a mentor, and be respectful of their time. Key #6 – You don’t have to know your mentors. I recently had the honor of interviewing Sir Richard Branson. It was awesome to talk to this entrepreneurial superstar who has been a mentor to Matthew and me for many years. Even after talking with him on the phone, I wouldn’t say I know Branson personally, but through his books, articles, and videos, he has mentored us more than just about anyone. If they have a body of content available, your mentor doesn’t need to know they’re your mentor. Key #7 – Show gratitude. Showing appreciation for someone’s mentoring is important. They aren’t doing it for the money, but because they want to help others. Showing your gratitude for their time and wisdom is the least you can do. Bonus key! Pay it forward. With the help of mentors and a lot of your own hard work, you’ll hopefully be very successful. But even before that point, you can be a help to others. Consider mentoring a young entrepreneur who needs the kind of help, guidance, and business resources you can provide. Finding the right mentor isn’t always easy, but it’s worth the effort. So if you don’t already have one or more great mentors in your life, use the keys above to find someone to mentor you.